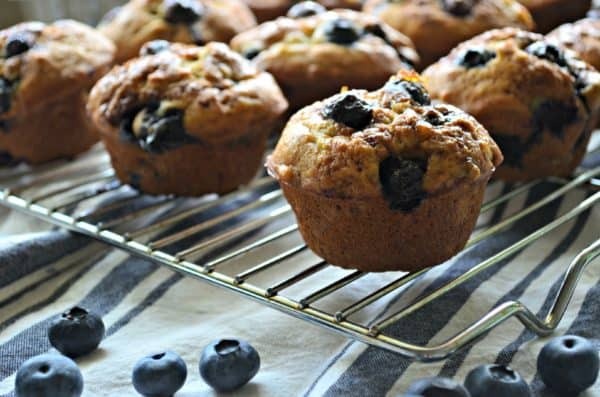 Use up ripe bananas and embrace the fruit of the season; blueberries and make my easy and super moist recipe for Banana Blueberry Muffins. Back in June our air conditioning went out. Now, in case you forget, we live in Florida. It was on average 90+ degrees. This was probably my worst nightmare especially since I was newly pregnant and I stay at home with my rambunctious toddler! However, luckily we moved into our home last year and our awesome realtor negotiated a home warranty into the sale of our home. Upside, we had to pay very very little for our brand new air conditioning unit the downside we had to wait THREE weeks. Three of the longest weeks of my life. Thankfully we happened to be on vacation during the first week, so it was no big deal, and then thankfully my inlaws took us in for two weeks. Now, what does this have to do with Banana Blueberry Muffins? While we stayed their for two weeks, my mother in-law and I took turns cooking. We would alternate cooking nights and/or just cook together. One thing I learned while living at their home for two weeks is that she bakes a sweet breakfast treat of sorts for the week. It’s the pre-breakfast to breakfast. I like the way she thinks. I had bought bananas that we never got around to eat and I knew I was gonna make banana bread with them. Especially since, my toddler was loving the banana bread on the cruise ship. The, morning I went to bake the banana bread I was gonna add chocolate chips into it, but as I searched the pantry, no sign of chocolate chips. Womp womp. Then, I remembered we had an abundance of blueberries. So, I rinsed the blueberries then tossed them in a little flour and added them to my batter. My idea of adding blueberries was genius. It was the perfect mix of banana and blueberry! It happened to be my father in-laws birthday that morning and both my mother in-law and father in-law slept in–or at least it felt like it since our crazy toddler woke us up at the crack of dawn. By the time they woke up the muffins were being pulled out of the oven. I can’t think of a better way to wake up then to the smell of freshly baked muffins! We all taste tested the plump muffins as they were fresh out of the oven. Everyone agreed that they were delicious with the addition of blueberries. 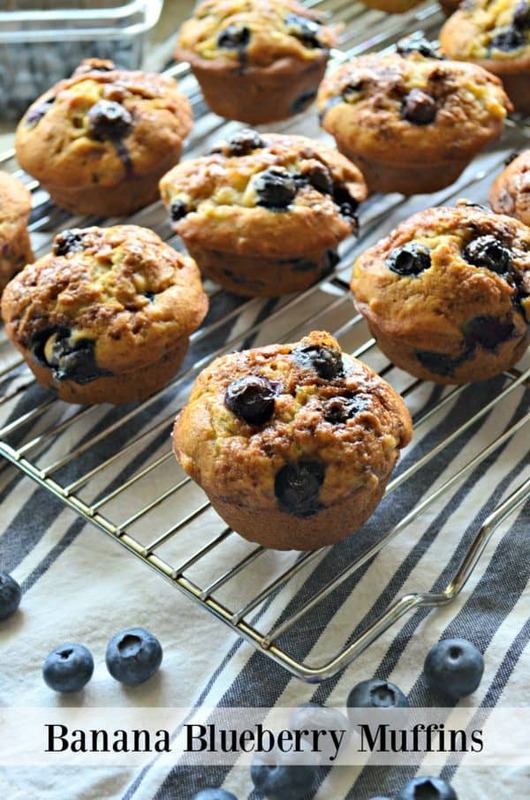 If your looking to switch up your breakfast routine I invite you to try my easy recipe for Banana Blueberry Muffins! Preheat oven to 350 degrees Fareneheit. Lightly grease a 9×5 inch loaf pan. In a large bowl, combine 2 cups of flour, baking soda and salt. In a separate bowl, cream together butter and brown sugar. Stir in eggs and mashed bananas until well blended. Stir banana mixture into flour mixture; stir just to moisten. In a separate bowl, mix together the fresh blueberries with 1 tablespoon all-purpose flour. Then carefully fold into the muffin batter until well incorporated. Spray cooking spray in muffin pans and then scoop batter into muffin cups. Repeat until all the batter is used. Bake in preheated oven for 20 minutes, until a toothpick inserted into center of the muffin and it comes out clean. 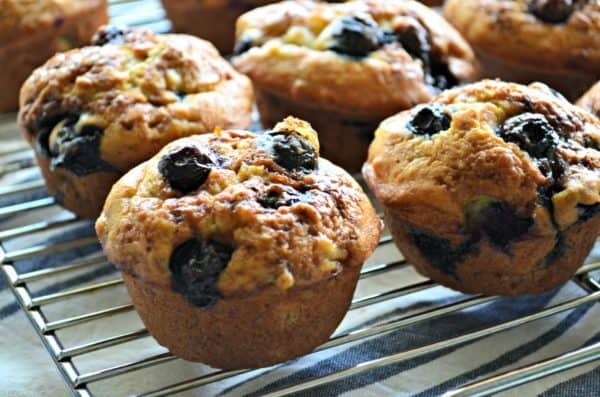 Let muffins cool in pan for 5 minutes, then carefully remove each muffin by using a spoon. Place on wire rack to cool completely.